PRC and BPT released the 17,904 Secondary teachers passer out of 56,596 examinees (31.63%) percent of all takers of the Licensure Examination for Teachers (L.E.T.) given last March 29, 2015. You can use this page to find the successful examinees with surname starting with Q – R – S – T. Please see also the other passers of the Licensure Examination for Teachers (L.E.T.) (March 2015). PRC also said that the dates and venues for the oathtaking ceremonies of the new successful examinees in the said examination WILL BE ANNOUNCED LATER. 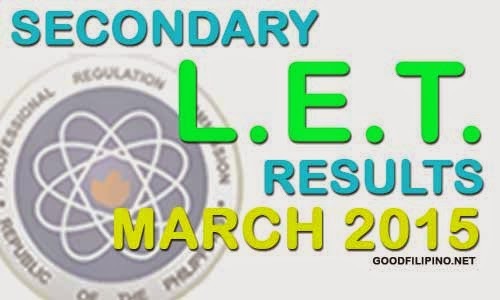 Comments or suggestions about "LET Results Secondary Level Passers (March 2015) - Q – R – S – T" is important to us, you may share it by using the comment box below.